Canadian brand Anthem's classy high-end D2V processor and P-series power amps wowed our high-end sensibilities when we saw them, leading to a three-strong lineup of more affordable AV receivers coming to these shores in 2011. Here we have the range-topping MRX 700 coming in at around £2,100 and competing with the likes of Denon's AVR-4311 and Onkyo's TX-NR5008. From the cosmetics alone you can trace the MRX 700's lineage from the D2V, but they share more than a few design features and philosophies. Compared to the D2V's cluttered looks, which we suggested had a fascia ideally suited to an enclosed cupboard, the 700 is positively stylish. The silver buttons and bold white logos on matt black are a long way from the elegance of British or Japanese receivers, but it's nothing like as cluttered as the D2V, and the side flap over the front inputs is a very neat touch. This contrast between AV receivers from differing nations continues under the casework, too. Anthem has its own state-of-the-art electronics and software design facility in Ottawa, shared with sister brand Paradigm, and it clearly has the cajones to forge its own path rather than follow the herd. 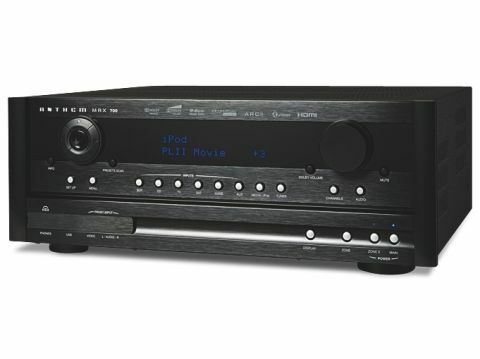 The MRX 700 is no Swiss army knife of functionality, and in a game of pure features strip poker it would be sitting at the card table in nothing but its boxer shorts long before the Denon and Onkyo. The focus is on delivering the best possible sound quality at the given price without diluting the R&D budget with widgets and fluffery that you may not use anyway. Of course, it has decoding for all mainstream standard and high-resolution movie and music sound formats, USB inputs with an iPod dock on the way, upscaling to 1080p, Ethernet networking and even a Dolby ProLogic IIz height channel option. But that is your lot for secondary features. There's no independent multi-room AV, or Airplay, no bespoke anti-jitter digital link-ups and (at present) no iPad app remote control. There is also an amazing lack of big-name component brands such as Anchor Bay, ISF, Burr-Brown etc, and virtually all the electronics are born and bred in-house at the Paradigm Advanced Research Centre, or PARC. Most notable of these is Anthem's own ARC EQ system, notable for being a lightly pared-down version of the ARC system found on the D2V. And that is the best-sounding EQ system of any I am yet to hear by a long, Canadian country mile. Set-up and installation is not necessarily for the faint hearted, though, because the protocols and accepted procedures used by almost all other manufactures have gone right out of the window. Unlike the competition, that supply a little plastic bodied set-up mic, the MRX range comes with a solid aluminium USB audio mic, an easily adjustable tripod, cables and software for your laptop. The whole set up procedure is controlled from the PC which runs thorough a complete Real Time Analysis (RTA) measurement before applying its comprehensive filters for best stereo music and multichannel movie response curves. ARC feels so much more flexible on the PC than an in-receiver-based system, and the filtering range runs from 5kHz right down to 20Hz – a lot lower than Audyssey's effective range. Moreover, the sheer number-crunching power and data storage requirements are moved to a dedicated device (your laptop, notepad, PC etc) offering much greater depth, detail and flexibility in the system. OK, I admit, the set-up is mind bogglingly complex. The laptop-based EQ will no doubt have some users running for the hills and the onscreen interface is simply not as logical or as well laid out as the slick GUIs on the latest Japanese receivers. If you do use the setup without the safety net of a dealer installation, I guarantee you'll be flicking back and forth through the manual wondering why certain things just aren't working. Still, we like a challenge. The 7 x 120W amps are traditional class A/B design, fed from a chunky power supply to ensure plenty of current for big multichannel swells. As per most receivers, the EQ system defaults to being on, but it is worth spending some time with the MRX 700 with the EQ off to start with. It's a robust-sounding beast with plenty of 'oomph' on tap. The natural stance is a heavyweight balance that delivers a soundstage forged of granite with lead trimmings and ballast in the belly. With suitably dense and moody movies such as Hellboy II on Blu-ray, the sense of dark foreboding is amplified with crushingly intense effects,and the bass presence threatens to squeeze the air out of your chest. In Hellboy II, as the tooth fairies fly around the auction house, the scale and dimension of the soundstage is perfectly formed, becoming wide, spacious and uncluttered. The effects come fast and furious with the newly dry and tightly focused bass underpinning each one. As Hellboy unloads round after round at the fairies, the effect is thrilling and immersive, the MRX 700 punching well above its price point in terms of adrenaline-fuelled action. But while impressive with the right movie, it's all a bit heavy for Love, Actually or Toy Story. Stepping the pace down produces sound that is cleaner, crisper and more infectious with the ARC engaged, bringing life and sparkle to slower-paced movies and Pixar classics alike. Dialogue is precision-crafted 'front of house' with admirable tonal accuracy to voices. Engage the ARC and the effect is nothing short of astonishing. The system's grip and control of the lower frequencies is stunning, turning phat bass with added room reverb into ultra-tight, mega-punchy effects with lightning-fast transient attack. Better still, it does this without culling any of the bass power. Quite the opposite in fact! Gunfire has incredible power that will flap your bell-bottoms with every round, and explosions attempt to physically pitch you off the sofa in a sharp-edged wave of percussive violence. The ARC's control over the subwoofer in particular is way ahead of the game, making even Velodyne's excellent built-in EQ on the DD18 sound woolly by comparison. It's an incredibly impressive and involving sound, but the ARC does have its limitations on the MRX series. For example, compared to the implementation on the D2V, it's not quite as sophisticated, and the upper frequency EQ stops at 5kHz. This means that any top-end issues borne of, say, feisty speakers with too much treble, for instance, or an over-damped room, packed full of Laura Ashley's finest soft furnishings, are left untouched. With my elderly Tannoys and their now rather smooth and rolled-off top end, the Anthem MRX 700 never achieved the sheer magic of the full-bandwidth D2V ARC system. That said, it is still very impressive and some seven grand cheaper, too. Cool. With the ARC tuned to perfection, the MRX 700 establishes a new standard of sonic performance at this price point, and leaves the rest of the pack sounding a little lacklustre by comparison. OK, so there is no Audyssey DSX, AirPlay, full multi-room, Napster, THX modes and so on, but does that matter? Possibly not.